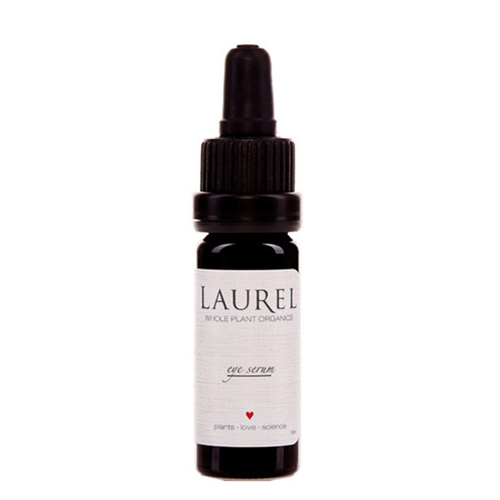 Eye Serum by Laurel Whole Plant Organics is the ultimate holistic eye serum. Crafted from 21 whole plant extracts, it includes a powerful list of naturals, like organic Iranian rose oil, Roman chamomile, pomegranate seed, gotu kola, bilberry and cranberry, to make the delicate eye area look smoother and brighter. Repeatedly recognized by beauty experts, it showcases how botanical ingredients can deliver such superb results to the appearance of the skin around the eyes. If you want to experience the powerful look and feel of high-quality concentrated organic plant extracts, this serum offers a strengthening and protective feel to the skin around the eyes (and anywhere else you decide to use it). This concentrated eye serum can be used day or night. It is oil based, so for some, it may not work directly under makeup. Tip: Add a drop to concealer when before applying. We've found this oil-based eye serum works best as a superb overnight eye moisturizer. Apply 2 drops to fingertips each evening to the delicate area around the eyes and gently tap onto skin. Don’t limit the use of this organic beauty blend to around the eyes. Apply anywhere to smooth the appearance of lines, such as around the lips and forehead, for a look of suppleness and hydration.